I hope you’re hungry! Polly and Rachel are with us today sharing an amazing stuffed baked potatoes recipe! This recipe is especially awesome because you can make it for dinner tonight and also make extra to freeze for another night! 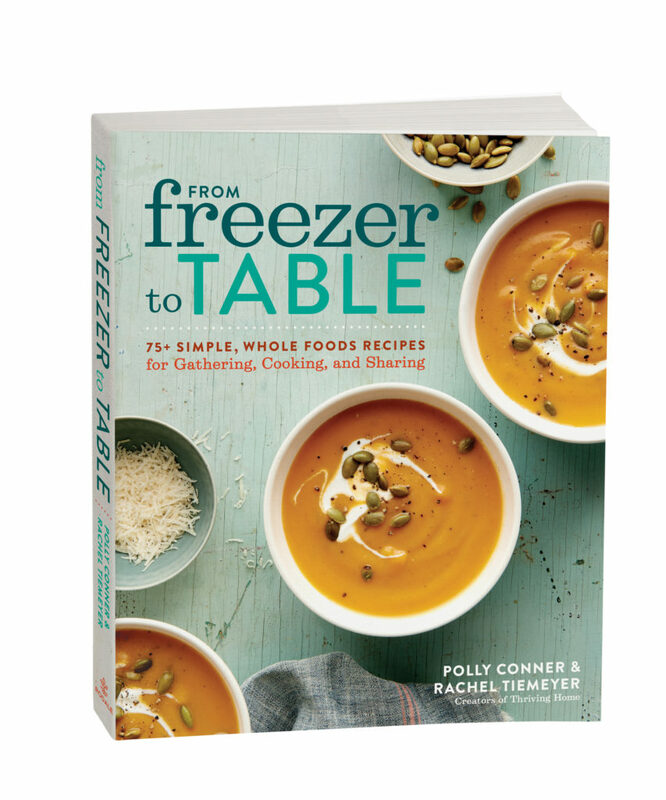 For those that missed my Instagram story, Polly and Rachel have just published their first cookbook called From Freezer to Table, it shows you everything you need to know to get started freezer cooking. (It’s a Best Seller on Amazon, btw!) 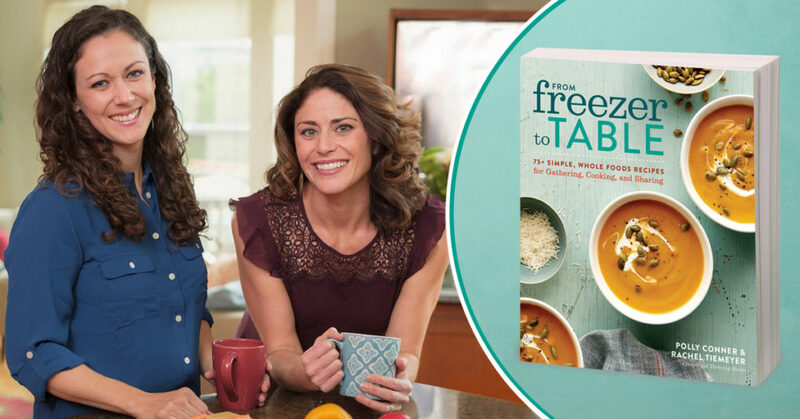 They are here today to share a bit about freezer cooking and share a favorite healthy recipe from their book! Casseroles? Mushy leftovers? Boxed lasagna? If you’re nodding along or had a similar answer, you are not alone. This is why Rachel and I have made it our mission to change the face of freezer cooking. We want to help moms embrace the time-saving, money-saving, sanity-saving benefits that we’ve personally experienced the past decade from learning to use our freezers wisely. When a freezer meal (one you make ahead of time and freeze before cooking) is prepared the right way, it can be fresh, flavorful, and full of texture! Not only will the recipes on our blog (Thriving Home) and in our cookbook (From Freezer to Table) surprise you, but we have aimed to make all of our recipes with real food ingredients. We’ve cut out the processed junk and created doable recipes that minimize the additives and preservatives that you will find in a typical grocery store freezer meal. 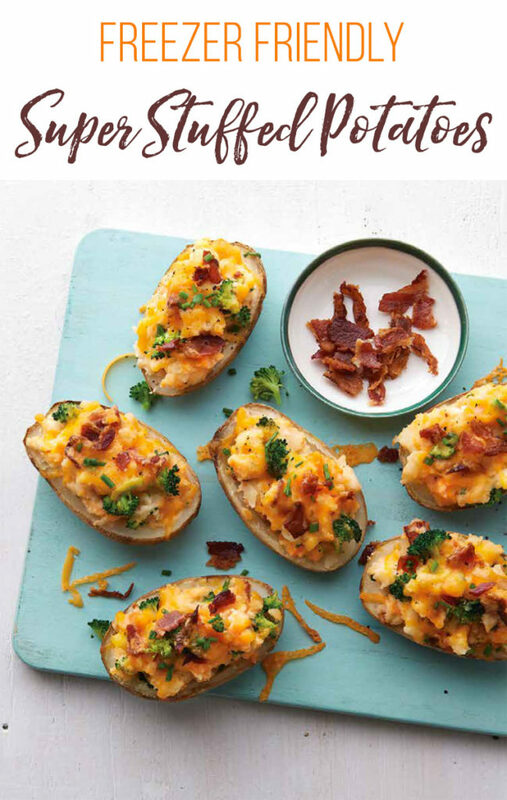 These rich-tasting, twice-stuffed baked potatoes are a recipe that you can feel good about. The Greek yogurt and chicken broth help replace some of the fat in this typically calorie-laden side dish, while the addition of two superfoods–sweet potato and broccoli–up the nutrition payout. These super spuds are both hearty enough to serve as an entree and decadent enough to serve as a side dish on a special occasion. Preheat the oven to 400°F. Wash the potatoes, poke a few holes in each one with a knife, and wrap only the sweet potato in foil (leave the other potatoes unwrapped). Bake on the middle rack for about 1 hour, or until soft in the middle when a knife is inserted. Let them cool enough to handle. Increase the heat to 425°F. While the potatoes bake, fill a medium saucepan about one third full with water, cover, and bring to a boil. Meanwhile, fill a medium bowl with ice and water. Once the pot of water is boiling, carefully drop the broccoli florets in, cover, and bring back to a boil. Boil for 1 to 2 minutes, or just until fork-tender (undercook just slightly). Remove with a slotted spoon and immediately plunge into the ice water to stop the cooking. Once cooled, lay the broccoli on a towel to dry and then chop into smaller, bite-size pieces that can be stirred into the stuffing mix. Place the stuffed potatoes on a foil or parchment-lined baking sheet and bake for 10 to 15 minutes, or until heated through and golden brown on top. To Freeze: Prepare potatoes through Step 3. Place in a single layer in a 13″ x 9″ freezer container or in 2 gallon-size freezer bags in a single layer. Seal well and freeze. To Prepare from Frozen: Thaw in the refrigerator for 12 to 24 hours or use the defrost setting on the microwave. Bake according to the recipe directions. If the potatoes are still partially frozen, increase the baking time until warmed through. Cover the tops with foil if they begin to brown too much. Cooking Tip: Work ahead! Many of these steps can be done ahead of time, like cooking the bacon, boiling the broccoli, or cooking the potatoes. Since my cooking time has to be swift in the evening, working ahead a tad is a game changer! We’d love for you to give this recipe a try, as well as the recipes in our cookbook, From Freezer to Table. In addition to the simple, delicious recipes in our book, you’ll find loads of information on freezer cooking, hosting freezer cooking parties, and running a on-going freezer club. Snag a copy today!